NEW CARLISLE, Ind. – International Truck has brought to market the new HV model, an updated WorkStar truck for vocational applications. The exterior went unchanged, but the HV now features the new interior that’s being adopted across most of International’s product line, including the LT and RH models. The key advantages of the new interior are a modern design, with more vibrant color driver display, and repositioned mirrors that offer better visibility. The company says its mirrors were moved forward to require less head movement – 15% to the left and 5% to the right. 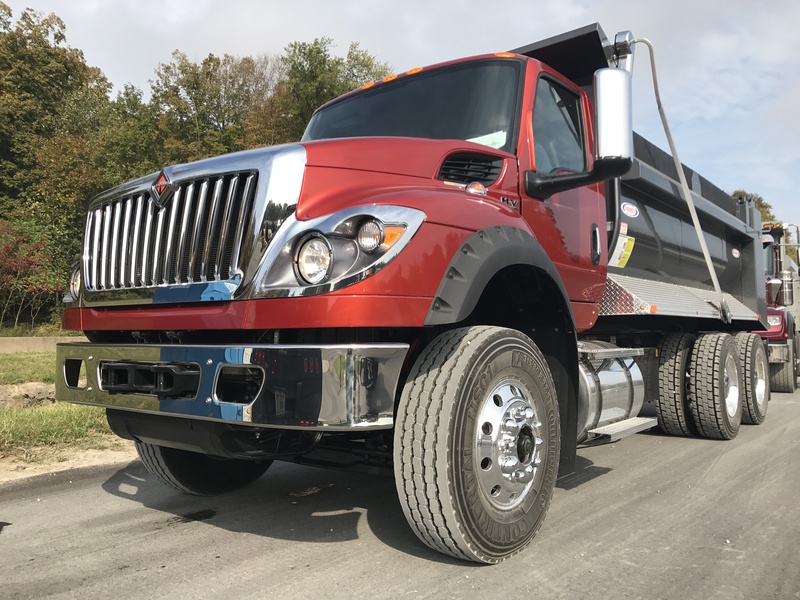 I drove an HV Series dump truck on the off-road course at Navistar’s New Carlisle, Ind., proving grounds in early October. The visibility was improved, thanks also to the removal of the vent windows and the lowering of the window beltline, resulting in more glass and fewer obstructions. New doors reduce exterior noise and will keep the cab more comfortable in extreme temperatures. They offer twice the stiffness as the previous door design, and feature a reinforced door pocket that doubles as a grab handle to support even the heaviest drivers when climbing in and out of the truck. The truck I drove had the standard International A-26 engine, producing 475 hp and 1,700 lb.-ft. of torque. The transmission was a six-speed Allison automatic, featuring the new steering column-mounted stalk shifter, which freed up some room in the driver environment. The new stalk shifter also controls the engine brake. The dash is better laid out, with a highly customizable center panel. It can house up to 30 switches to accommodate complex body types. The HV also gets an improved HVAC system, including a max defrost setting that can clear a window of ice much faster than the previous design. A new vent has been added in the center of the console to provide greater comfort to the middle passenger in bench seat configurations. Larger switches are easier to access while wearing work gloves. A power distribution center is mounted on the top of the passenger side dash. The circuit breakers are protected from spilled beverages, thanks to a cleverly designed trough that directs any liquids – even spills as large as a Big Gulp – away from the sensitive electronics. The Bluetooth speaker has been relocated to a better home on the door post for improved audio. The HV is intended for lighter-duty vocational applications than its bigger brother, the HX Series. The HX comes in an aluminum cab and maintains its own distinct styling and interior, with some features carried over from the now defunct truck making partnership with Caterpillar. The HV interior is a straight carry-over from the LT and RH and the truck features a steel cab. It’s a less expensive option that’s still capable of some heavy-duty vocational applications, but the 12.4-liter A-26 engine is the largest available engine offering. It can also be spec’d with all-wheel drive, which the HX cannot. The HV offers much improved visibility over the WorkStar, and a quieter ride thanks to the more robust, better-sealed doors. The 50-degree inside wheel cut afforded excellent maneuverability and the entire dash and driver display bring a more modern look and feel to the interior of the HV. The previous interior hadn’t changed significantly in 16 years, so WorkStar drivers will appreciate the update. The same cab that was carried over to the HV was also given to the International LoneStar. 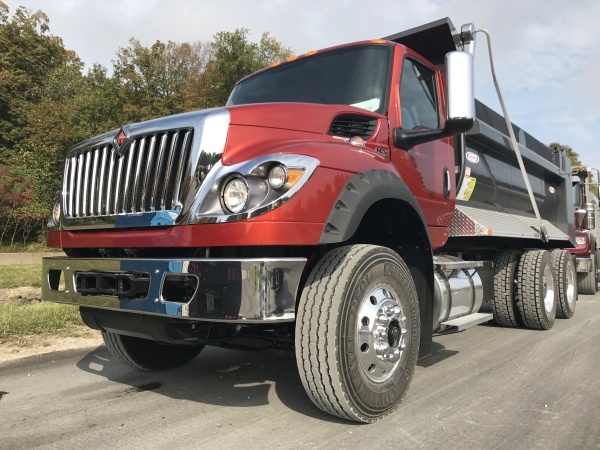 “The entire driver environment has been redesigned, and we did that with feedback from driver clinics,” said Tom Harting, during a drive around Navistar’s three-mile oval track. 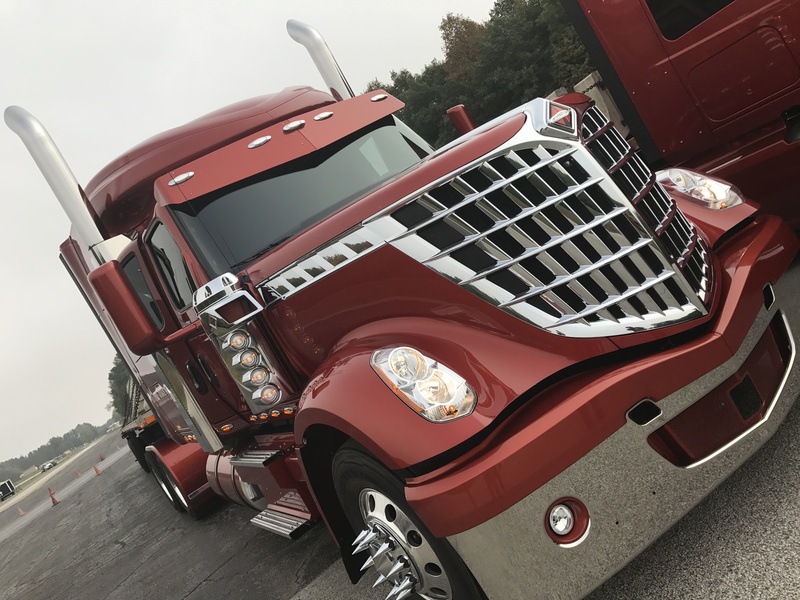 The Inernational LoneStar highway tractor retains its unique, bold exterior design, but now incorporates the interior improvements being rolled out across International’s product line. Harting said image-conscious fleets and owner-operators are the main LoneStar buyers, with some larger fleets buying a few as reward trucks. It’s available exclusively with the Cummins X15 engine.